You’re heading out for some fun at the beach… or maybe you’re just heading to the grocery store, but your child has an affinity for jumping in puddles. Either way, if you’re like me, you’re probably tired of the smelly, stinky, and ruined shoes that result after they’ve been soaked through by your little explorer. Thankfully, some shoes have been created with just this problem in mind. But buying waterproof shoes is a little more complicated than just picking up a new pair of sneakers. There are several things to consider, and we’ve got everything you need to know right here. Read on to learn about how to pick the best water shoes — and which ones may be best for your little one. Use the links above to check the latest prices or read our in-depth kids water shoes reviews below. 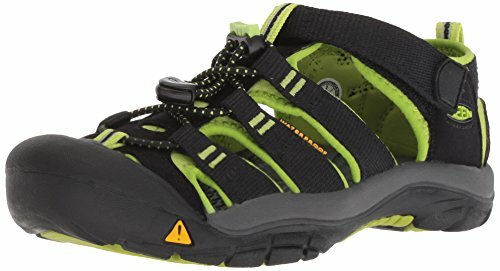 Does My Child Need Water Shoes? Can’t I Just Use Regular Shoes? The primary function of this kind of footwear is to keep the feet safe and comfortable while walking on surfaces that have the potential to be sharp, painful, and even dangerous. Water shoes allow children (and adults) to experience everything the outdoors has to offer while preventing injury to the feet. Broken glass or other trash. Wearing water shoes can provide your child with a barrier between their tender feet and hazards located in or around water. Not only do they contribute to safety, but they also ensure your child’s comfort. Even though the seaweed on the bottom of the lake poses no real threat, it can feel strange and deter children from even entering the water. They can also keep your child safe at the local pool. They’re typically manufactured with rubber bottoms that prevent slipping on the pool deck or changing area. 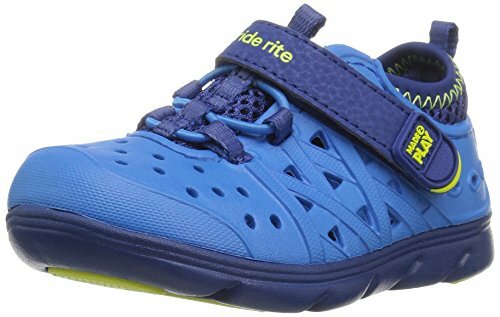 And finally, while water shoes are intended for a very specific use (in or around water), many a mom has figured out that they’re a great all-around shoe for their active children. Because they have a protective, slip-resistant sole coupled with a quick-dry body that allows the foot to breathe, they serve many children well as an everyday summer shoe. You may be tempted to save money by simply allowing your child to wear an old or inexpensive pair of shoes or sandals in the water to protect their feet. This can be problematic for the following reasons. If you allow your child to wear regular shoes in the water, they do not breathe or dry the same way that water shoes will. Because wet shoes provide a warm, moist environment for bacteria and fungi to grow, it can not only result in a foul smell but could even cause conditions like athlete’s foot (source). Wearing footwear that wasn’t designed for water use can also result in injury. Material that wasn’t manufactured to be worn while wet can rub against the feet, causing blisters and discomfort. Finally, putting regular shoes in the water has the potential to ruin them. They’re not made from bacteria- and mold-resistant material, which means they can get smelly after being submerged in water, and eventually break down. 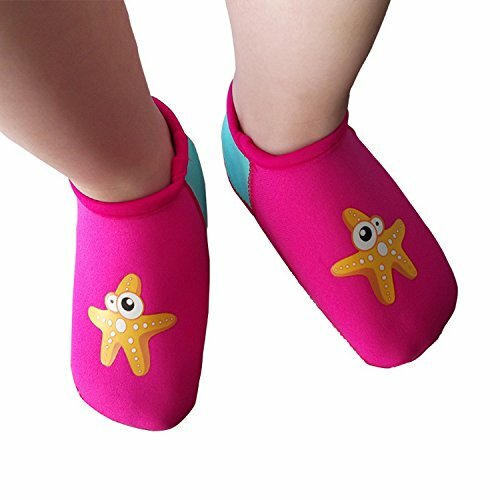 Aqua Socks or Wet Shoes: Basically a skin-tight neoprene foot covering, this option offers slip resistance, warmth, and keeps the sand out, preventing it from rubbing between your child’s shoe and their sensitive skin. However, because of the thinness of the sole, these don’t offer as much protection from the elements underfoot. This option is primarily used by on-the-water enthusiasts (think kayakers, canoers, jet-skiers) but might not be the most practical for a little one who’s needing protection from rough terrain. 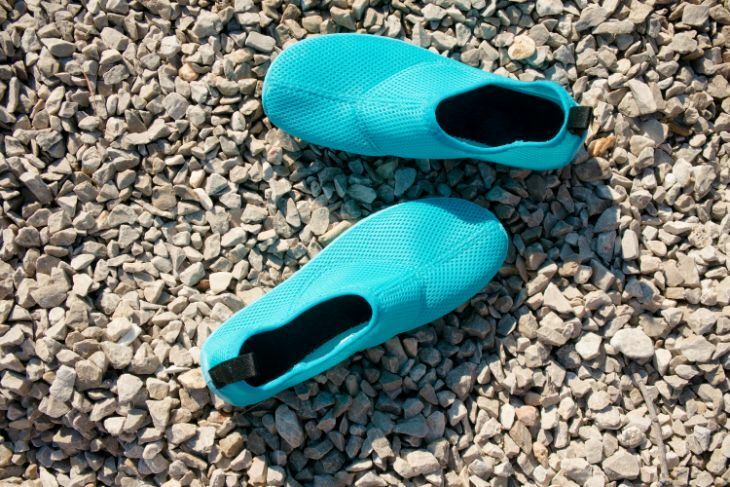 Water Shoes: These look like typical shoes but are made of plastic, mesh, or some other material that will dry quickly and allow the foot to breathe. They have a thick sole to provide protection, and usually, have a reinforced plastic or rubber toe to keep your little one from hurting themselves on unseen underwater obstacles. It also helps to keep the sand out of the front of the shoe. 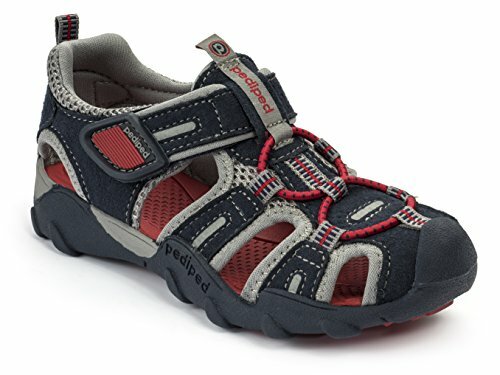 Water Sandals: These are constructed much like water shoes but without the reinforced toe. They keep feet cooler during hot summer months but allow more sand to enter the shoe and offer less toe protection. Still, they’re made from waterproof and breathable materials, so you know that they’ll hold up in water, and keep little feet healthy in the process. Primary Use: Where will your child be using their water shoes? If you’re on a beach in sunny California, aqua socks may be perfect for protecting their feet from the hot sand. If you’re wading in a Midwest river, you’ll likely want full-protection shoes to keep them from stubbing their toes on underwater rocks. And if you’re hanging out by the lake in the mountains, water sandals may be just right, offering underfoot protection but allowing the water to flow easily through their toes. Material: You have a variety of materials to choose from. Straight-up plastic won’t absorb water at all and will dry practically immediately. But it can rub against your little one’s skin or feel hot since they aren’t breathable. Mesh is another option. Regardless, skip any shoe made of leather as these won’t hold up in water. Independence: Do you have a child who insists on putting everything on by themselves? Or do you have a baby, and you’re the one dressing them? Water sandals are the easiest to put on — and if you’re looking for ease, choose a sandal with simple velcro straps. Sole Thickness: If you think your child will be using water shoes as an everyday shoe, or if you’ll be using them in locales with sharp or uneven terrain, choose shoes that have a thick, solid sole for maximum protection. However, if you’re dealing with an early walker who’s still getting the hang of things, you might want to choose something less bulky and clunky to help them keep their balance. Your big kid needs it all: comfort, function, and protection. For your active explorer, choose shoes that can easily go from the playground to the water — and everywhere in between. Select sporty footwear that offers a thick, protective sole, breathable uppers, and comfort that won’t cause blisters and rubbing. Keens have long been the powerhouse of the water shoe industry, and they have a solid reputation for a reason. Not only do they provide thick protection on both the sole and the toe, but the bottom of the shoe is built more like an athletic shoe or boot for exceptional traction. Each shoe is adjustable up top with both an elastic lace and a velcro closure, and the quick-dry fabric has built-in odor controlling technology. What’s more, these shoes offer unparalleled anatomical support with a removable footbed, keeping your child comfy even if they’ve been running all day. Finally, they come in every color of the rainbow, meaning you can choose your kiddo’s personal fave, or choose black or tan as a unisex option that can be used for hand-me-downs later. They’re adjustable for a good fit. Thick, sporty soles will last through all your kid’s adventures. Durable, so you get your money’s worth. They don’t come in half sizes. They are a little pricey. For your active boy, choose shoes that can follow him anywhere he wants to go. Pick ones that are versatile, so if he gets tired of water play and runs off to explore something else, his feet will stay comfy and protected. Choose shoes that are designed for water but also function as a traditional athletic shoe. 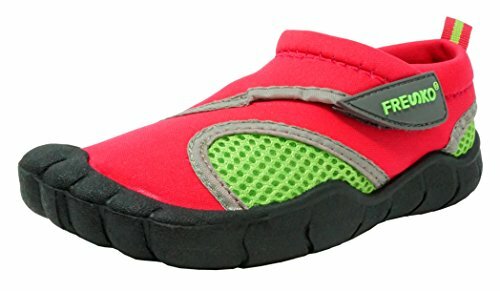 If you have a hard time keeping your active boy confined to either the splash pad or the playground, these shoes will let him run between both without worry. They have an anti-microbial lining that will prevent the growth of bacteria and keep them from smelling if they get wet. 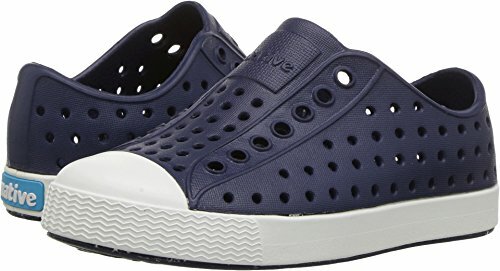 They’re also designed just like a regular shoe, so they have proper arch and ankle support, but are constructed out of rubber (along with quick-dry synthetic fabric), so they have the functionality of an athletic shoe and the durability of a water shoe. 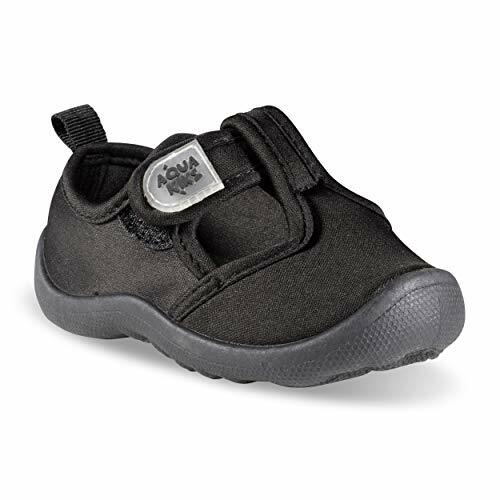 The rubber sole and closed toe also mean that your kiddo’s feet and toes are adequately protected. They can be easily washed by hosing them off. They won’t smell when wet. They come in many different colors. They’re very versatile, so you’ll get a lot of wear out of them. Sand could cause rubbing if it gets in the shoes. These would not be well suited for the beach. Your little toddler is independent and wants to do things on their own. They also love to explore. Choose a shoe they can put on and take off on their own, as well as something that provides adequate protection, and keeps any irritating sand out so you don't have to deal with a seaside meltdown. Bonus if you pick one that you won’t mind if they wear all the time — because when a toddler loves a clothing item, they’ll never want to leave the house without it. Welcome to the best of all worlds: waterproof upper, skin-tight protection from sand, and a skid-proof sole that’s thin enough to feel the ground beneath but thick enough to offer protection. All of this is packaged in a water sock with extra toe protection. The neoprene upper is water resistant and quick-dry, and its elastic fit with velcro closures make them easy to put on for both you and your toddler. These will give your child the protection they need without feeling too bulky, and they’re versatile enough to wear in a number of different environments. They’re sturdy yet still flexible for maximum fun and adventure time. They fit snug around the ankle to keep out sand. They’re machine washable for when you get back home. The foot is fully covered, which may make it hot to wear. Some reviewers complained about durability. When choosing shoes for the pool, pick ones with a solid rubber sole. Fully neoprene water socks will snag on the concrete pool deck and wear quickly. 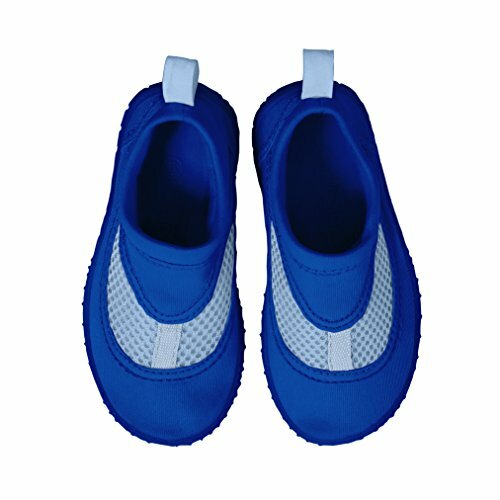 Pool shoes should be thin for comfort (not sporty like a water shoe or sandal), but still provide slip protection and a good barrier between your child’s feet and the hot cement. These are made of quick-dry neoprene combined with breathable mesh on the uppers, allowing the air to circulate properly around your child’s foot — even when wet. The bottoms are made of rubber along with a non-skid sole to ensure traction, keeping your child’s foot protected and preventing accidents on the most slippery of surfaces. They come in several different colors, and the elasticity of the shoe along with a built-in pull tab helps with easy off-and-on. There’s a handy loop for easy pull-on. They have a protective sole. They’re made of quick-dry material that won’t go moldy or smelly. It’s difficult to get the right fit. They run a little large. There is no adjustable closure to ensure proper fit. Your baby may or may not be walking yet, but they still need quality foot protection. Whether they’re toddling along or simply rolling around lakeside on a blanket, your baby’s shoes are going to be in the sun and the sand. Choose something that offers them the gentle protection they need without adding too much bulk. These shoes are great for your little one who’s just learning to walk. The thinner soles provide protection against hot sand and some of the more uncomfortable ground obstacles without having a thick, bulky sole that can hinder an early walker. They’re constructed of waterproof neoprene, meaning they’ll stretch to insert the foot but retract to stay firmly in place. But in the event your little one removes them or tosses them into the water to play, they’ll float, so you won’t lose them. They protect from hot sand. These shoes float so you won’t have to go deep diving to find them if they come off. The sole is not thick, so it’s not suitable for rocky terrain. You’ll use these for only a limited period; they’re best for small babies but will be outgrown quickly. Kids and moms will love these adorable water sneakers. With a classic sneaker silhouette, they’re made from 100% ethylene vinyl acetate with strong rubber soles and sides. The all-over perforations allow your child’s feet to dry quickly while preventing mold and bacteria. The special waterproof material molds to your child’s feet to offer lightweight protection and security on slippery surfaces. However, you’ll want to make sure you get the right size. If they’re too small, the perforations can cause a strange pattern on your child’s feet and even blistering. Irritation may also occur if too-small shoes get too hot. Make sure to get a comfy size. Because they’re unisex, these water sneakers work well for children of all ages and are available in toddler, little kid, and big kid sizes. We also love that you can choose from over 20 different bright colors. Your kids will be excited to wear them, which will provide you some peace of mind. Features a classic sneaker silhouette. All-over perforations prevent odor and mold while helping feet to dry quickly. Available in over 20 bright and fun colors. Can cause blisters and irritation if you get the wrong size. Your girl wants shoes that are cute, but she also needs functionality. Choose shoes that will protect her feet while she’s off exploring whatever terrain she’s discovered without allowing sand and water to cause irritation and blisters inside her shoe. These cuties are light enough for the beach yet rugged enough to prevent foot injury. The rubber sole will keep your child’s feet protected, and the fitted uppers will keep the sand out — unlike sandals or other designs. You can make sure they fit properly with the adjustable closure, and the high-quality material is odorless. Reviewers agree that they dry very quickly, and the traction on the bottom is designed with water play in mind, so your child is safe. They have an adjustable closure to ensure a snug fit. Some reviewers found them too tight around the ankle. They tend to run a little small. They do not offer toe protection. Wherever your summer adventures take you, these water shoes will protect your little ones feet. Created to work on any terrain, they feature a durable four-way stretch upper and an adjusting strap closure so they’re easy to slip on and off. The thermoplastic rubber outsole has special grooves to help repel water away so your little one can have a more sure grip. Plus, it not only helps your child stay safe when playing in or around the water, but also prevents injury from sharp objects or hot ground. Though this shoe is made of 100 percent textiles, that doesn’t mean it will get soggy. An air mesh insert panel promotes quick dry and maximum comfort. They’ll also be safe to wear when completely dry, so you don’t have to worry about irritation or blister burns caused by all-rubber shoes. Dries quickly thanks to inner mesh panel. Thermoplastic rubber provides a stronger, more sure grip. Works on all sorts of terrain. Some moms have had a hard time finding a good fit. Velcro is a mother’s best friend when buying shoes for her independent toddler. They’re easy to open wide and put on, and just as simple to remove. But a velcro closure also allows them to be adjusted for unique foot sizes to ensure they’re secure and won’t fall off while your toddler is playing in the water. 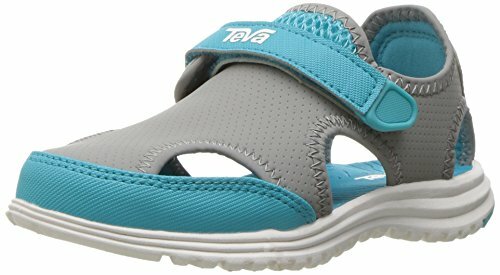 This hybrid option from high-quality brand Teva blends the comfort of a sandal with some toe protection. Because let’s be honest: kids aren’t exactly the most careful people on the planet. With these, they’ll be spared the pain of a stubbed toe while still allowing their feet to breathe. They’re constructed from a synthetic waterproof material that dries quickly and has a velcro closure so you can make them as tight (or as loose) as you need to fit properly. To cap it off, they’ve got a thick, rubber sole for maximum traction and safety while walking. It has a thick, protective sole. Constructed from a quick-dry water resistant material. It has an easy to use velcro closure. Closed toe is soft (not hard plastic or rubber). Some reviewers found the toe peeked out of one of the cutouts. These shoes are on the pricier side. If you’re just out at the beach, your child’s feet primarily need protection from the hot sand and the occasional shell. For this reason, you don’t need an ultra-thick sole if you’re just hanging around for sand castles and a little splashing. Simple water socks are a great choice. Lightweight so they won’t interfere with your child’s budding walking skills, the protective yet thin rubber sole of these socks will allow your child to feel the ground so they can keep their balance. And with the uppers made from a blend of polyester and spandex, they’re elastic enough to cling to their feet and not fall off. But even if they do, don’t worry — they float for easy recovery. 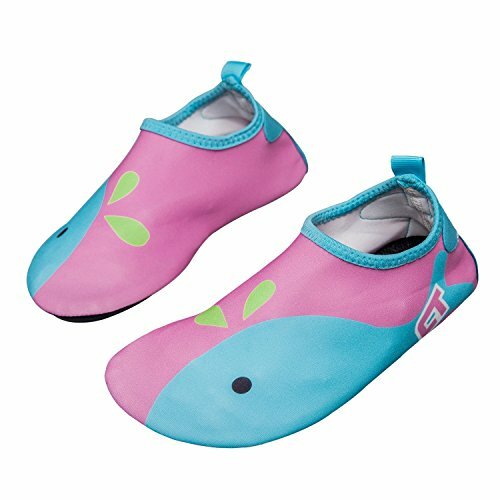 These aqua socks are available in a wide range of designs, so you’re sure to find one that will fit your little one’s personality. And because they’re so colorful and cute, you probably won’t have any trouble convincing your toddler to wear them, either. Elastic construction makes putting them on simple. They have a rubber sole for protection. They’re thin, so they won’t interfere with early walking. They dry quickly, so you can pack them up in a cinch after use. They’re not thick, making them less suitable for rough terrain. Some reviewers did not find them durable. If you’ve got a toddler with wide feet, you know that not every manufacturer makes their shoes in “wide” sizes. Thankfully, there are some that do to keep your child’s feet from developing blisters or feeling uncomfortable. Choose shoes that are specifically manufactured for wide feet (look for the “W” notation next to the size) or, if all else fails, choose shoes made of neoprene or spandex that are stretchy and will accommodate a wider-width foot. These water sandals not only come in wide toddler sizes, but they also come in gender-specific colors so you can buy cute ones just for your little boy or girl. They have a neoprene lining that will help stave off the stink that can come with wet shoes, and also contribute to quick drying. They were developed with your child’s foot health and comfort in mind — in fact, they’re approved by the American Podiatric Medical Association for promoting healthy foot development. Further, the rugged, flexible sole will make sure your child’s feet are protected wherever they go. They’re available in wide sizes. They have a flexible neoprene lining. They’re designed for healthy foot development. They are a little costly. Some reviewers complained about rubbing. These would not work well on the beach with sand. My favorite is Keens water shoes. That’s what my kids have always used. Not only are they versatile (so I don’t have to buy multiple pairs of shoes each summer), but they hold up well and keep my kids’ feet safe — both the bottoms and the toes. And with the velcro and elastic closures, they’re easy enough for my kids to put on independently but secure enough that they won’t fall off. What terrain will your kids’ water shoes be exploring this season? What are the Best Life Jackets for Babies & Toddlers? So helpful, thank you! I’m a first time Mom of a 14 month old. Getting prepped for water play to escape the heat of this summer.